You are going to see the mock drafts. The 14284924131 NFL mock drafts that the NFL Network & ESPN will put out between now at May 8, the night of the actual & real NFL Draft, for TV purposes to fill time between now & the NHL Stanley Cup Playoffs & the start of the NBA Playoffs. Today, we are not going to do a mock draft, but just look at certain players & the type of player & team they could go to & really the raw reasons why they may or may not work in a certain situation. Texas A&M former Heisman Trophy winning quarterback Johnny Manziel. Let’s start with former Heisman Trophy Winner & Texas A&M Quarterback Johnny Manziel is the most talked about NFL draft prospect in recent memory. He has the style, the moxy, the confidence & the skill to be a true NFL prospect & possibly the #1 pick overall in the draft. My issue is that Manziel has to be able to show off the professional maturity to be able to convince a locker room that he can be the guy for years to come. This week, the worldwide leader has been showing a lot of George Whitfield Jr.,the guru of quarterbacks, on the network showing off some of the drills he has put Manziel through while working with him in California, getting him ready for the scouting combine, his personal pro day & now for the NFL Draft. Manziel has done everything to try to be as humble & down to Earth as he can be, but it may not be in his DNA. That doesn’t make him a bad person at all, but he might just be a high strung, naturally high energy guy. That’s okay. As long as he can be a leader on Sundays & not cause a lot of unnecessary distractions. We can see him going to the Houston Texans & becoming an instant celebrity on a much higher level than he already is because of the strong Texas A&M fan base in the Houston area, but the Texans may be looking at Blake Bortles, Jadeveon Clowney, Khalil Mack & others at that spot, or moving out of the first-round altogether considering they have so many pieces in place already to be a playoff team next season. I can see teams such as Houston, Oakland, maybe Minnesota, & Jacksonville absolutely needing a quarterback right now & going with Manziel. But then again, as we mentioned earlier, there are some other top quality candidates on the board such as………Jadeveon Clowney. South Carolina former DE Jadeveon Clowney. 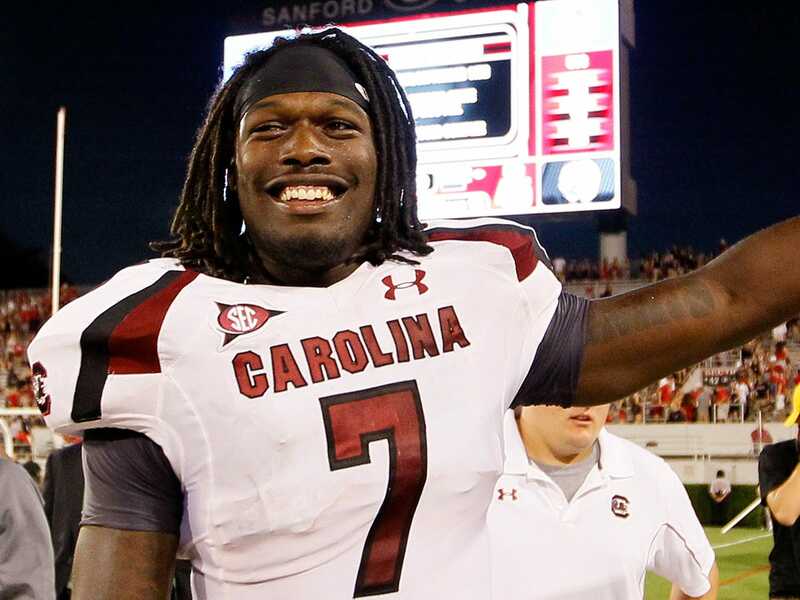 Clowney has been the most feared defensive player in college football since he arrived as a freshman at the University of South Carolina. We can all agree that Clowney didn’t always go all out because of the fact that he was trying to protect himself & his own personal investment in his body from getting hurt & ruining his draft chances. Be that as it may, Clowney has been an absolute nightmare for teams around the SEC, consistently commanding double-teams & making sure the quarterback knows where he is on the field at all teams. Many NFL GMs believe that in order to have a strong defensive unit upfront, you must have 2 outside rushers that can put constant pressure on the quarterback on a regular basis, which makes Clowney & Buffalo’s Khalil Mack very interesting prospects. Speaking of Mack, many people around the country haven’t seen much of Mack because he played in the MAC Conference at the University of Buffalo, so his competition wasn’t as strong as what his other contemporaries had to go up against on a week-in & week-out basis. Nonetheless, Mack was an absolute beast on the field, blowing up offenses on a consistent basis, & from watching a large amount of MAC games in this part of the country, seeing that he had a better motor than Clowney in terms of not taking plays off at any time. There was never a time when I felt that Mack wasn’t consistently working & grinding to the football as opposed to protecting the body for financial investment, which is completely understandable as well. Former University of Buffalo LB Khalil Mack. Mack may not be the first pick overall, but he is going to make a team such as Minnesota or even a Detroit Lions squad who could use another pass rusher even better if they were to trade up into the top 5-7 picks of the draft. But Khalil Mack isn’t the only guy who magically busted onto the scene out of nowhere – a quarterback who came on out of the blue was Central Florida QB Blake Bortles. Bortles had an amazing Fiesta Bowl game on a national stage & led the UCF Knights to their first BCS victory. But the issue I see is that the stats aren’t that great. He threw 26 touchdowns & 8 interceptions, which aren’t the most impressive numbers that you want to see when you are going after a big time quarterback to be your franchise player. Honestly, I am wondering if the main reason that Bortles got all of the mainstream attention is the fact that he has a smoking hot model girlfriend in Lindsay Duke. Model & University of Central Florida student Lindsay Duke, also the girlfriend of NFL prospect Blake Bortles. We will break down more prospects next week, but for now, check out the various posts here at the DraftKingsMaster, as well as the new DraftKingsMaster Store featuring the best in the NFL, NHL, MLB, NBA, NCAA, & UFC apparel.